The antibiotic azithromycin may reduce the risk of recurrent wheezing in infants hospitalized with a common respiratory infection, according to a small pilot study at Washington University School of Medicinein St. Louis. Evidence suggests that reduced wheezing may lower an infant’s risk of developing asthma over the next several years. The study appears Nov. 18 in The Journal of Allergy and Clinical Immunology. Respiratory infections are common in a child’s first years of life. Most are mild, but some infants develop such difficulty breathing, they must be hospitalized to keep their oxygen levels in normal range. The investigators focused on bronchiolitis caused by respiratory syncytial virus (RSV). Bronchiolitis is an inflammation of the small airways in the lungs. When severe enough to require hospitalization, bronchiolitis greatly increases the risk that a child will go on to develop recurrent wheezing — a whistling sound in the lungs — and asthma. Beigelman and his colleagues were interested in trying to stop the common pattern of wheezing after bronchiolitis, which often progresses to asthma. Asthma is a chronic lung condition that causes inflamed and narrowed airways, excess mucus and difficulty breathing. It is treated with inhaled steroids that reduce inflammation. But if it is poorly controlled, asthma can be life-threatening. The researchers suspected that past efforts to reduce wheezing after RSV bronchiolitis using asthma drugs — typically corticosteroids — had been ineffective because these medications tend to relieve inflammation triggered by allergies rather than viral infections. Previous work in mice has shown that azithromycin (Zithromax) — an antibiotic commonly prescribed for bacterial infections such as pneumonia and ear infections — reduced inflammation during viral respiratory infection. 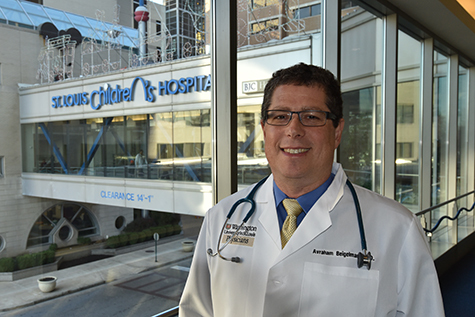 So Beigelman and his colleagues performed a small study testing the drug in 40 babies admitted to St. Louis Children’s Hospital with RSV bronchiolitis over two consecutive winters. The virus is at its peak during the winter months. The researchers randomly gave azithromycin to half of the infants for two weeks and a placebo to the other infants over the same period. They analyzed levels of an immune system marker of inflammation in the blood and in mucus from the infants’ noses. Perhaps most relevant for patients, they also monitored the number of wheezing episodes in the following year. The results showed no differences in the levels of inflammation markers in blood samples over the two weeks following bronchiolitis, but significantly lower levels of such markers in the nasal samples of babies receiving azithromycin. This work was supported by the Washington University Institute of Clinical and Translational Sciences, grant number UL1 TR000448; the National Center for Advancing Translational Sciences, KL2 TR000450; the Children’s Discovery Institute of Washington University and St. Louis Children’s Hospital, and by Siteman Comprehensive Cancer Center and NCI Cancer Center Support Grant, P30 CA091842. Beigelman A, Isaacson-Schmid M, Sajol G, Baty J, Rodriguez OM, Leege E, Lyons K, Schweiger TL, Zheng J, Schechtman KB, Castro M, Bacharier LB. Randomized trial to evaluate azithromycin’s effects on serum and upper airway IL-8 levels, and recurrent wheezing in infants with RSV bronchiolitis. The Journal of Allergy and Clinical Immunology. Nov. 18, 2014.